In the penultimate week in Toppserien, LSK continued to drop points this time after behind held away to Sandviken as Arna played out their own draw with VIF and Grand got the better of Lyn. 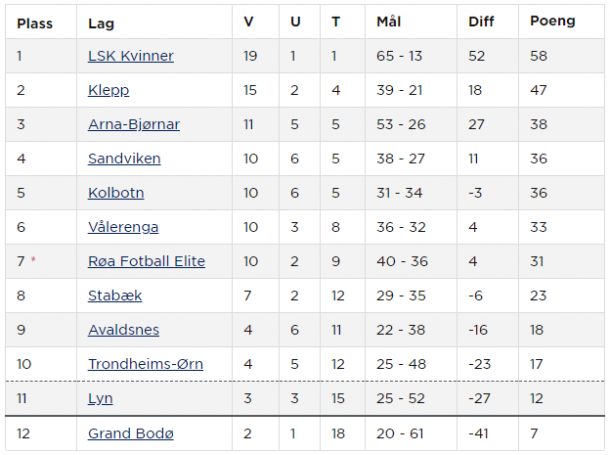 Elsewhere Klepp, Røa and Kolbotn came out on the right side of 2-1 wins, seeing off Avaldsnes, TØ and Stabæk. Lyn saw their chances of avoiding the relegation play-off dissolve with a narrow loss away to already relegated Grand. 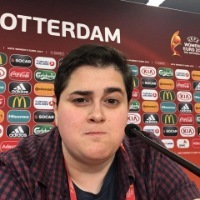 The match between the bottom two decided two minutes before the break when Vilde Fjelldal latched onto Sofie Skjelstad Jensen’s curt pass, as she jogged into the box and picked out the bottom left corner. The match expectedly close from start to finish, the win marks Grand’s second of the season and Siiri Välimaa’s first clean sheet. Having secured a second-place finish, the Tractor Girls were keen to take their lap of honour at home to Avaldsnes but had to come from behind against the struggling side. A goal down two minutes before the break when Meryll Abrahamsen raced behind and slipped the ball beyond Lindsey Harris. Rallying after the break, the hosts restored parity when half time substitute Elisabeth Terland took advantage of a poor clearance from Line Johansen to bring the ball under control and fire it home. The comeback completed ten minutes later when Hanne Kogstad toe-poked the ball home after Johansen had saved her initial effort. In fine form all season, Svava Rós Gudmundsdóttir continued her goalscoring form when the Dynamite Girls clashed with Trondheim, the Icelandic attacker off the mark three minutes in. Set-up by the industrious Rebecka Holum, Gudmundsdóttir arrived in the box in perfect time to hammer Holum’s square ball into the back of the waiting net. The lead held until the last knockings of the first half when Julie Adserø found a way passed Kirvil Odden at the second time of asking. With the defence not having covered themselves in glory for the equaliser, the hosts were given a reprieve 20 minutes from time when Gudmundsdóttir fired in the winner, again sending the ball over from a yard out. 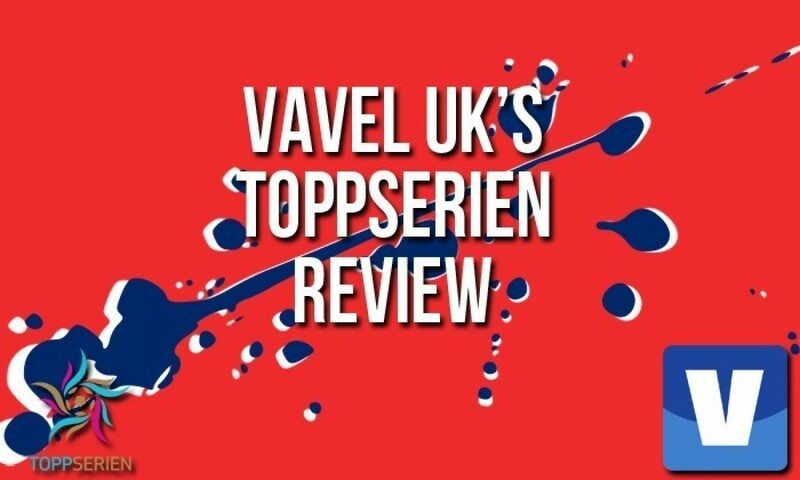 With their perfect season cut short following a loss to Klepp last time out, the Toppserien champions continued their weakened form against a steely Sandviken side. The match marking the first time LSK have drawn a blank in 31 matches in all competitions. For Sandviken, it was another hard-earned point in what will unquestionably go down as a successful season, and they remain the only team to keep LSK out all year. Still with a chance to finish third, Kolbotn avoided a slip up against a resurgent Stabæk side to claim their tenth win of the season. A goal to the good ten minutes before half time thanks to Marit Lund’s calmly taken penalty, Synne Jensen’s volley just after the hour enough to restore parity. The match decided four minutes from time when Lund’s direct free kick slid off of Siri Ervik’s left glove and into the back of the net. Having missed out on a last-gasp dash for second, Arna came up against an improving VIF side in Oslo, the visitors finally finding a breakthrough after the hour. With her ninth of the season, Amalie Eikeland’s curler looked to be enough for all three points until Stine Ballisager Pedersen found an equaliser at the death. The Dane’s close-range header at a corner enough for a point at the Intility Arena.